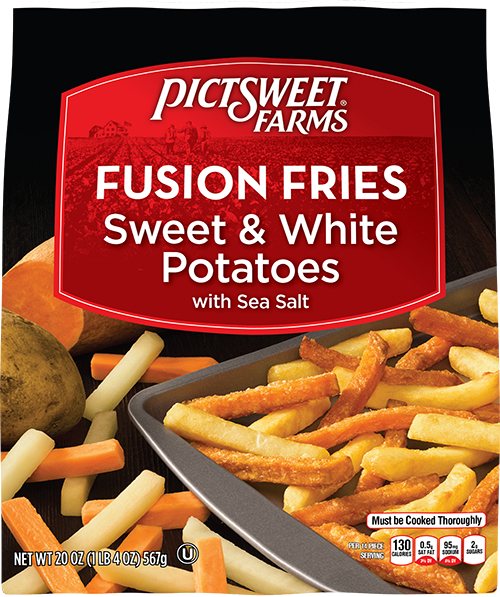 ​Experience the great taste and crunchy texture of Pictsweet Farms Fusion Fries. We use only the highest quality sweet and white potatoes and season them with just a touch of sea salt. Sweet Potato Fries are also available in Crinkle, Straight, and Waffle cuts for the whole family to enjoy. Sweet Potatoes, Russet Potatoes, Soybean Oil, Modified Potato Starch, Rice Flour, Dextrin, Sea Salt, Leavening (Sodium Acid Pyrophosphate, Sodium Bicarbonate), Extractive of Paprika (Color), Xanthan Gum. CONTAINS SOY INGREDIENTS.